Fitness and exercise is a funny thing. When we’re doing nothing we seem pretty happy. Eventually most people will end up having some sort of epiphany in which they realise they’ve gained weight, have a small breakdown then vow to change their life and hit their goals. However, for the most part the time spent doing nothing won’t have worried them too much. The strange bit comes when they start exercising. The thing to remember here is most people don’t actually need to do much to reach their goals. The problem is Instead of focusing on doing their chosen exercise correctly and consistently and improving their eating habits gradually they decide that that isn’t enough for them. They start training and suddenly their on an Olympic schedule. Trying 7 days a week twice a day and eating half a lettuce to fuel it. It lasts about a week then they inevitably burn out and go back to doing nothing and being happy to do nothing for another 6 month. I’m sorry but are you really that stupid? If you can’t see why this mentality is causing you to fail then training isn’t your only problem. If you genuinely want to change yourself focus on small sustainable changes and stop thinking you need to take things to an obscene level in order to lose a bit of weight. Find a form of exercise you enjoy do it 3-4 times a week and begin to make small consistent changes to your nutrition. That’s it! 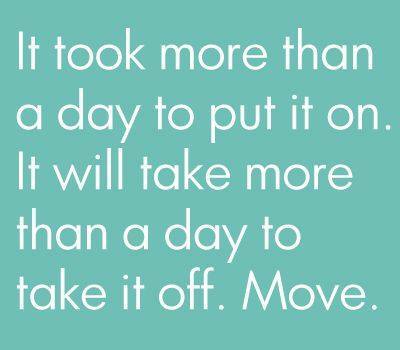 Doing more won’t make you lose the weight quicker, it doesn’t work like that. The only thing you’ll lose quicker is your motivation. It takes time to lose weight in the correct way and unfortunately for you you’re not special; you have to be patient like everyone else. Did you put the weight on overnight? So why do you think you can lose it overnight? It’s time you learned from your mistakes and approached things in the correct way and maybe this time you will actually make progress.